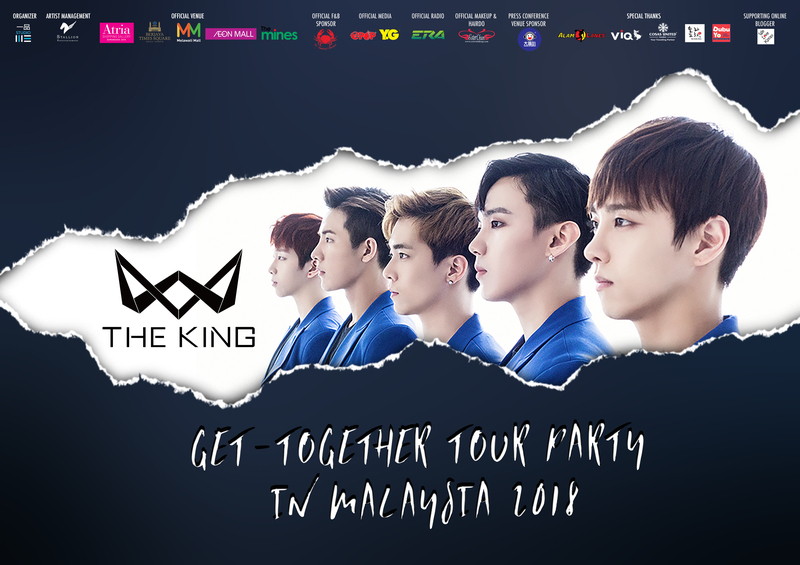 The Korean idol boys group THE KING is coming for The King Get-Together Tour Party in Malaysia 2018. The King will come to Malaysia from April 27 to May 1, 2018 for five days promo tour. THE KING is five young man from South Korean and made their debut back in 2012. Since debut, they mainly focus on Hip-Hop and R&B genre. Before debut, they actively took part in various performance inclusive to perform at Hongdae, Korea and Japan. Upon debut, they also participating in Incheon Asian Games 2014 for congratulation celebration. The King’s member had performed on musical stage with others well-known musical stars. The King main activities are in Japan and Thailand. Currently, The King’s fan club in Thailand has more than 50,000 members. Due to this, The King had exclusive interview with Thailand’s entertainment magazines and TV shows specifically conducted for them. During Sung Hoon’s event “Korean Opera Night” half year ago, The King was invited for the opening performance and make the crowd gone wild. 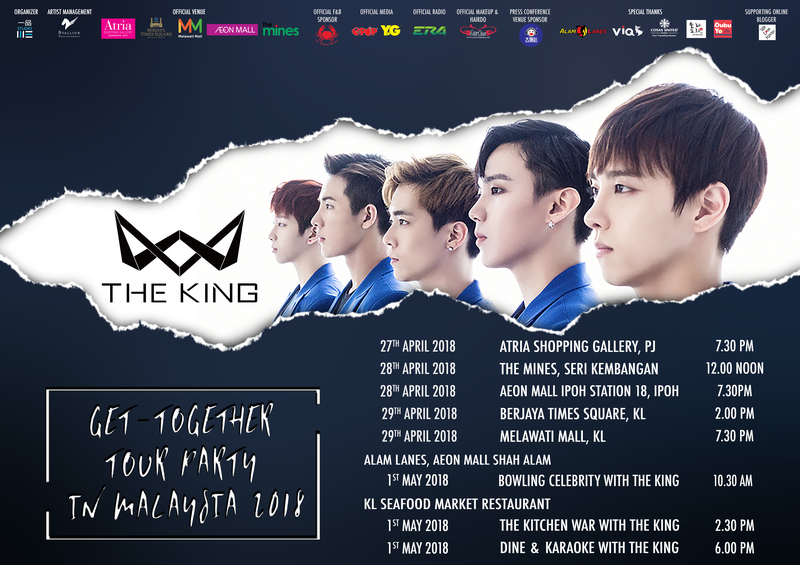 This time round, The KING will officially meet and greet their Malaysian fans through this spectacular promo tour The King Get-Together Tour Party in Malaysia 2018. Not only singing performances, Malaysian fans also are given opportunity to have an up-close interactive activities like on stage games, fan signing, hi-touch and more. The King's signature showcase will be held at Malaysian well-known shopping mall including Atria Shopping Gallery, Berjaya Times Square, The Mines, Aeon Ipoh Station 18 Shopping Centre, and Melawati Mall. In addition, the organisers also prepare several special events exclusive for PREMIER (Yi Pin Studio membership) to experience memorable activities more than others. Last but not least, we want to thanks to our sponsors for Official Venue Atria Shopping Gallery (Petaling Jaya), The Mines (Seri Kembangan), AEON MALL Ipoh Station 18 (Ipoh), Berjaya Times Square (Kuala Lumpur), Melawati Mall (Kuala Lumpur), Official F&B Sponsor KL Seafood Market, Official Media YG & EPOP, Official Radio Era Jer, Official Makeup & Hairdo Ester Make Up Paradise Studio Academy, Press Conferences Venue Sponsor Loud Speaker Family Karaoke, Setia Walk Puchong and Special Thanks to Alam Lanes, VIQ Apparel, Cosas United, Sola Pocha, Dobuyo and Supporting Online Blogger We Love Kpop. Thank you for your continuous support.